As 2014 comes to an end, we wanted to take a moment to reflect on some of the tips that have been shared over the past year to help grow your practice. Summarized below are a few blog posts that provide unique perspectives on managing your practice, utilizing technology, and enhancing patient communication. 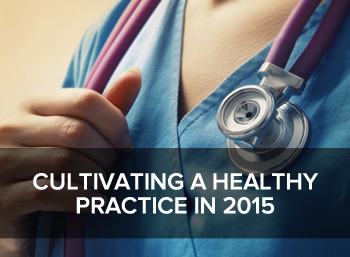 Building a practice can take a considerable amount of time and investment. Read about Dr. Corey Schuler’s experience from trying to build his practice organically to engaging with a business coach. The result was a 400% increase in business. Do you know where your practice is going? Do you know where you’ve been? Keeping track of Key Performance Indicators (KPIs) can help you understand the most important metrics affecting your business. Anne Lague Zorich, provides insight on tracking approaches for both new and returning patients. One of the most common complaints from patients is the amount of time they spend in the waiting room. Although influencing the wait time may not be an option, there are amenities that can be included to make their wait time more productive and comfortable. More and more patients are using mobile devices every day to monitor their wellness. Learn about some of the apps available for weight management, reminder notifications, relaxation and patient education. Patients have access to more health information than ever before; learn how you can patients empower your patients with this information in hand. There are many channels that you can use to communicate with patients from digital solutions like email marketing, social media or text messaging to traditional channels like direct mail and phone calls. Learn about the best way to use each channel to reach a variety of patients.